Kids really enjoy making ornaments at Christmas time. Here's another easy ornament to try. These gingerbread men cut outs are made from craft foam. They were purchased very inexpensively at the Dollar Tree. Of course, you could use a gingerbread pattern to cut these out yourself. 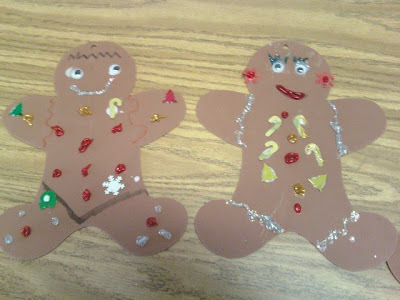 Be sure to provide your little one with glue, glitter, buttons, sequins, etc to decorate their gingerbread person. Be sure to check out these other Christmas and ornament ideas. Coming Soon: A New Name!